Throwing single-use plastic "away" doesn't mean it actually disappears — it ends up in our oceans and smothering our beaches with profound and lasting effects to everything in its wake. 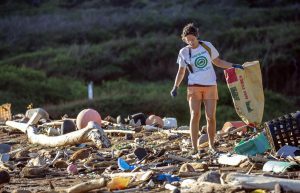 Greenpeace partnered with the Protect Kaho'olawe 'Ohana (PKO) and Kaho'olawe Island Reserve Commission (KIRC) to do a beach cleanup and brand audit at Kanapou beach on Kaho'olawe Island, Hawaii. Greenpeace Ocean Director John Hocevar near plastic trash piles. I’ve spent the past two weeks in Hawaii with the Greenpeace Arctic Sunrise. As nice as it was to have a chance to come to Oahu for a series of meetings, presentations, and receptions with our local partners, it’s our visit to Kaho’olawe that I was really been looking forward to. The smallest of Hawaii’s eight main islands, Kaho’olawe is uninhabited. The island is dedicated to Kanaloa, the god of the sea, and still considered sacred by Native Hawaiians. But that didn’t stop the U.S. military from using Kaho’olawe for target practice for half a century. In more recent years, the island became a rallying point for the Hawaiian sovereignty movement, triggering protests and legal actions that ultimately forced an end to the bombing in the 1990s. Since then, Kaho’olawe has been closed to commercial use and set aside for cultural and educational purposes. Unfortunately, the island has more challenges in store. 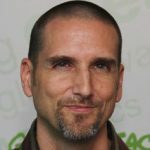 Hawai’i is only a few hundred miles from the Great Pacific Garbage Patch, an area twice the size of Texas where currents have concentrated plastic pollution from all over the Pacific Ocean. 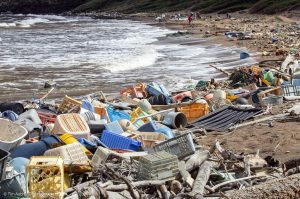 When the winds and currents shift, enormous amounts of debris can be dumped on beaches facing the Garbage Patch. 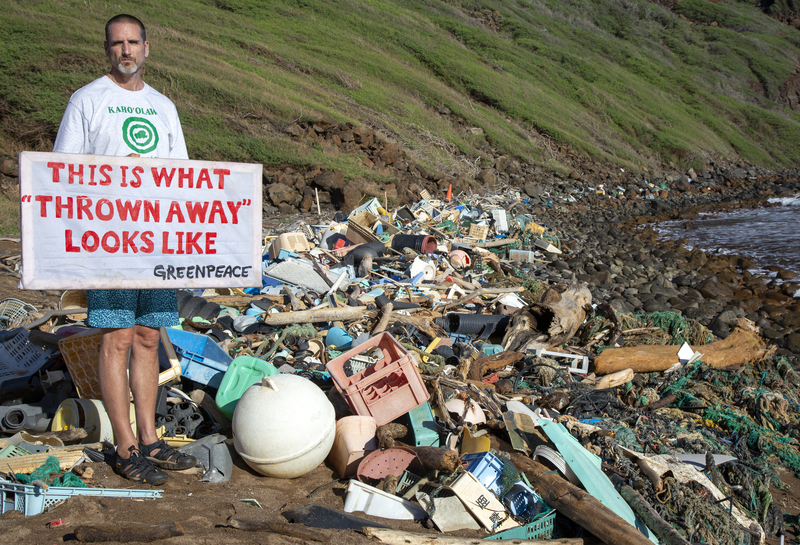 Kaho’olawe is particularly vulnerable, and because it is uninhabited, the trash really builds up. Plastics and trash piled up on the beach after washing up onshore. We went ashore with representatives of the Protect Kaho’olawe Ohana, the Kaho’olawe Island Reserve Commission (KIRC), and Sustainable Coastlines Hawaii. As we approached the beach, we were horrified to see how much garbage there was covering the full length of the bay. The closer we got, the worse we could see it was. We circled up, and Lopaka led us in a quick briefing and prayer. He seemed shaken — there were three times as much trash as he’d ever seen. We divided into groups and set off to start gathering piles of fishing floats, nets, beverage cases, bottles, bottle caps, fishing traps, and other plastic debris. Greenpeace’s Lisa Ramsden surveys trash on the beach. We all spent the better part of the day lugging heavy debris off the beach and onto boats, heading through the surf to bring it back to the ship. Load after load, two and a half tons in the end, we started to make some progress under the hot sun — but only on our narrow stretch of beach. We couldn’t help but see that farther down the beach in both directions there was far more garbage than we’d be able to remove, even if we had a week or two. All of us were feeling sad and angry, as well as sore. We found a baby black tip reef shark right at the shoreline, nearly decapitated by the nylon net wrapped around its neck. We picked up hundreds of hagfish traps, lost or discarded by fishermen thousands of miles away. We struggled with buoys the size of bathtubs, and baskets, buckets, and nets half buried in the fine auburn colored sand. We picked up toothbrushes and lighters, straws and forks. 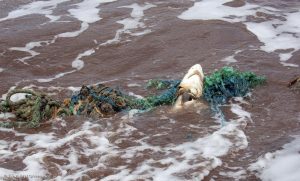 A dead shark hangs from its entanglement in abandoned fishing nets on the beach during the first day of the beach clean up. 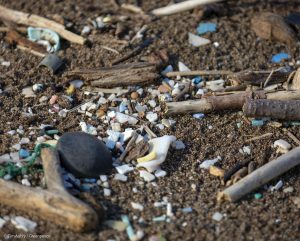 We sifted microplastics and fragments out of the sand, watching in despair as more flowed in on each wave. At the end of the day, we all felt exhausted and more sad about the scale of the problem than positive about our contribution. Rougher weather was predicted, so we were afraid that we were going to have to leave the beach looking little better than we found it. Fishing gear and microplastics mixed together on the beach. We were able to go back for a second day, though, leaving the ship as the sun was just starting to rise. 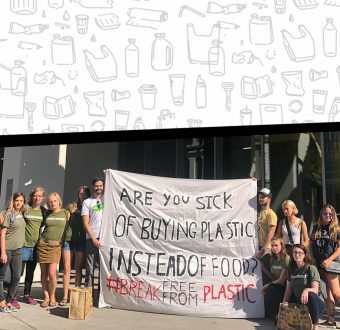 I started out focusing on picking up branded trash that we could connect back to the companies that sold it. Slowly and surely, the beach started to be revealed as we carted away load after load of trash. So much of what I do is aimed at keeping things from getting worse — climate change, industrial fishing, offshore drilling, and mining — there was something immediately gratifying about being a small part of helping heal this sacred island. It reminded me of visiting Tiritiri Matanga Island, a wildlife sanctuary about 18 miles off the coast of Auckland, New Zealand. The island was stripped of trees and used for sheep farming until the government opted not to renew the farmers’ lease. Today, the island is one of the most important habitats for several endangered bird species, including some that live almost nowhere else in the world. Americans have successfully convinced our leaders to protect some spectacular places, and our network of parks, monuments and sanctuaries are rightly a source of pride. Do we have the combination of long-term vision and the volunteer spirit that could turn an island from a sheep farm into an ecological wonder? I’m not sure, but I have a feeling that this is one of the things that will be needed from us in the coming years. I hope to see you there. 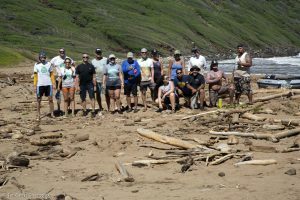 Some of the second day beach clean up crew: Pictured standing from left: Yordan Georgiev, Ryan Schleeter, Lisa Ramsden, Davey Khoury, Lopaka Aiwohi, Kate Melges, Eric Brundage, Hannah Strange, Rebecca Mattos, Pearl Wu, Katie Flynn-Jambeck, and Cody Nemet. Kneeling from left: Harmony Lambert; Jason Sanada, Ka’apuni Aiwohi. 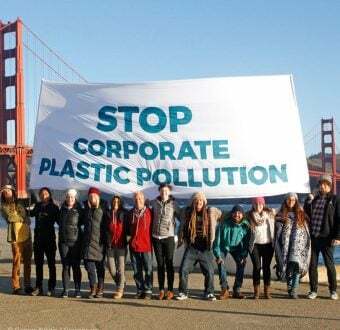 Even more urgently, can we rise to the challenge and urge corporations and governments to make sure that we stop producing single-use plastics? I think we’ve got this one! Are you with me?